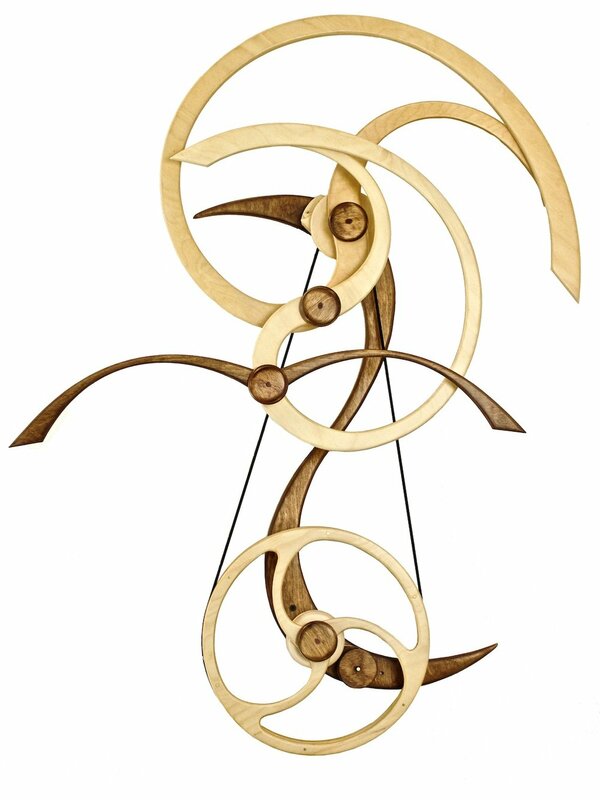 Sky Quest is a direct result of my work in creating the tandem bird sculpture Sky Duet. I love the way the Sky Duet carrying wheels flow together and I wanted to use the same type of flow to create a single floating bird sculpture. This required just a bit of modification because for a floating motion the carrying wheels must rotate in opposite directions. After a few experiments Sky Quest evolved. I decided to make Sky Quest's heritage clear by using a similar reverse S base to tie the sculpture parts together. Despite the similarities in form between the two designs, their unique motions separate and define them. Sky Quest, like all of my flight-themed designs has a floating, zen like quality. It is a relaxing and peaceful sculpture to watch. All of David's sculptures come with a detailed directions booklet, mounting screws and anchors. Those sculptures that need it also come with a mounting template to assist you with placement. Sky Quest has a template. Sky Quest ships in two parts. Below is a video with David demonstrating how easy it is to combine the two pieces plus a little bit on how to wind the sculpture.